Iowa City is offering new, optional carts for organic waste and recycling to curbside pickup customers to promote eco-friendly, waste-reduction practices starting this summer. 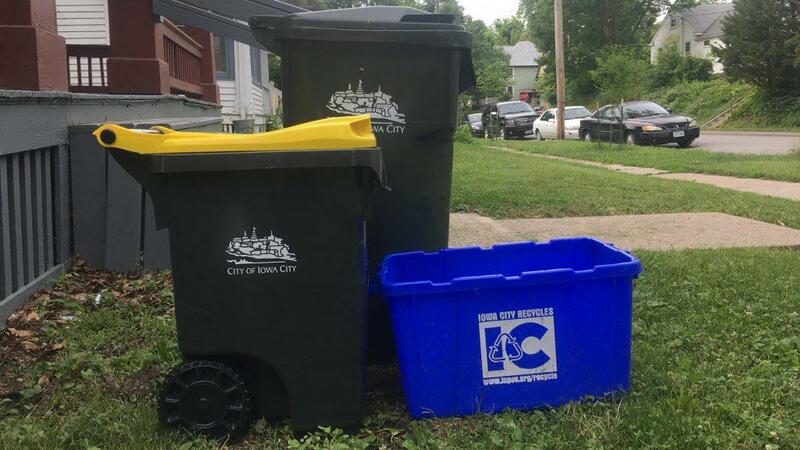 “There are still a lot of curbside customers that we’re trying to reach to let them know what programs are available to them, and we’re trying to break down barriers by offering some different cart options,” Iowa City recycling coordinator Jane Wilch said. The carts are easier and safer for residents and waste-management staff, she said, because the wheeled carts latch onto the trucks, meaning no one has to lift them. Two sizes of organics carts, 25- and 95-gallon, and 65-gallon recycling carts can be reserved online or by calling Resource Management at 319-356-5151. The Iowa City Landfill will compost the organic waste, mostly food scraps, yard waste, and paper products. Wilch said the 25-gallon carts are good for households with little to no yard waste. The 95-gallon carts will hold waste from bigger yards. The 65-gallon recycling carts come in response to high demand for bigger recycling containers. Wilch said many customers have expressed discontent with the city’s standard 18-gallon bins. Students renting houses may be surprised to learn that the cart program is open to them, because single-family homes through four-plex units receive curbside service, even when rented. “Anyone we can reach who’s new in town and wants to participate, we’d be happy to get them carts,” Wilch said. The new carts follow changes to the organic-waste program implemented in January, when a $2 pickup service charge on all curbside customers’ utility bills replaced official $25 stickers for organics containers and mandatory city of Iowa City yard waste bags, priced at $1.25 each. Customers may also use their own 20- to 35-gallon upright containers or paper bags for yard waste, but they cannot include food waste without a cart. Residents picked up more than 300 25-gallon organics carts on June 14 at a two-hour distribution event at the Public Works Complex, 3800 Napoleon Lane. Two more events will be held on July 18 from 11 a.m. to 1 p.m. and Aug. 14 from 4 to 6 p.m., and the city will deliver bigger carts throughout the summer. Iowa City native Christy Waters picked up her 25-gallon organics cart at the recent event. She said she’s been waiting for Iowa City to start a program such as this for years. “If the community can make recycling and disposing of waste easier for members, maybe more people would do it,” she said. Resident Carol Ebinger said she likes the curbside carts and believes they will encourage people to get involved. “I just think it’s important that everybody do what they can to help the environment,” she said. Wilch uses the distribution events to get information to residents similar to Waters and Ebinger. She hands out informational fliers at distribution events to encourage maximum composting while minimizing harmful contamination. “We know that there’s some discomfort around compost being looked at as maybe being gross,” she said, which is why the city also distributes two-gallon countertop containers for food scraps with the carts, to make composting as simple and clean as possible. While such items as meat bones and dairy products, which cannot decompose in typical backyard piles, are compostable in commercial facilities such as the landfill, nonorganic “natural” materials, including glass, metal, and pet-related waste, are not. Wilch said when people put such materials in the city’s compost, the load sometimes has to be thrown away.